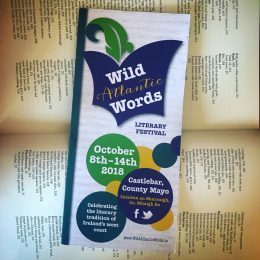 On an unseasonably warm October evening, we were privileged to host an evening event at Rua for our town’s ‘Wild Atlantic Words’ literary festival. Now in its third year, the programme this year was another wonderfully eclectic mix of authors from a wide spectrum of literary interest including Mary Robinson, Pat Mc Cabe and local historian Ivor Hamrock. 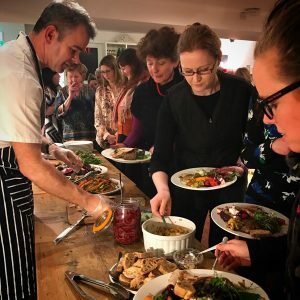 Our task at Rua was to add to the bill by inviting a recently published author, ideally based or hailing from the West coast of Ireland, and who would be able to entertain us with stories based on an expertise in matters of food or food history. To this end, we aimed high, and our first choice was to issue an invite to Margaret Hickey. 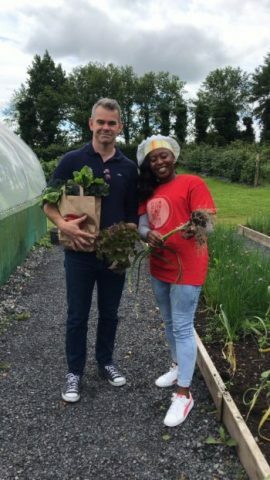 Based near Portumna, Margaret was a former editor of Country Living magazine, and also pursued a freelance writing career, contributing articles on food, drink and travel to most of the British national press, including The Financial Times, The Guardian and The Times. 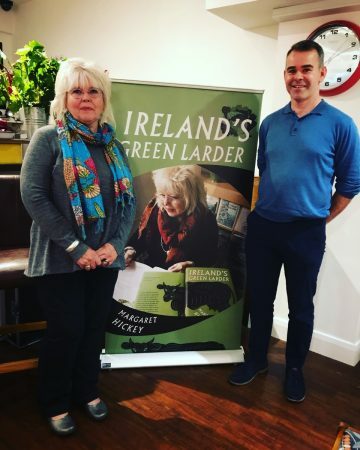 Our shop had recently got hold of her most recent work ‘Ireland’s Green Larder’ and we had been enthusiastically promoting it to anyone with a passing interest in Irish food. 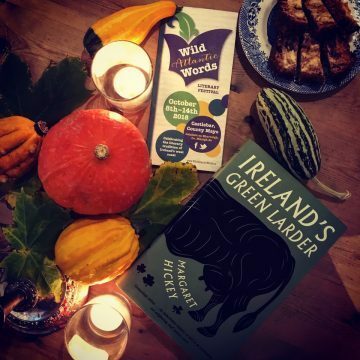 Described as ‘A glorious ramble down the centuries telling the story of food and drink in Ireland’, the book is filled with wonderful stories and gems of information about our nation and its relationship with food and drink through the centuries. We were delighted when Margaret graciously accepted our invite and came to see us at Rua on the Wednesday evening of the festival. Once the crowd gathered just after 7pm in the upstairs café on Spencer Street, Margaret wasted no time in launching into a catalogue of stories from the pages of her book, featuring information on how the Irish monks taught the French how to make cheese, and how our food story began in Mayo’s Ceide Fields, established 1000 years before the Pyramids were built. There were also lots of questions from the interested attendees and debate ensured on our nation’s checkered history with eating fish and current appetite for offal. 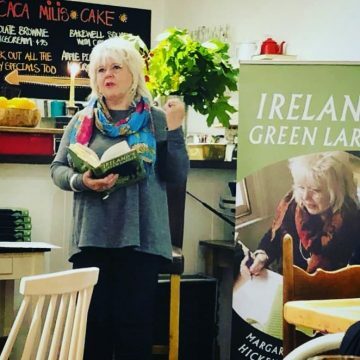 It was a great evening, and we are very grateful to the Wild Atlantic Words committee for inclusion in the festival, and, of course, to Margaret for coming to speak and entertain us at Rua. 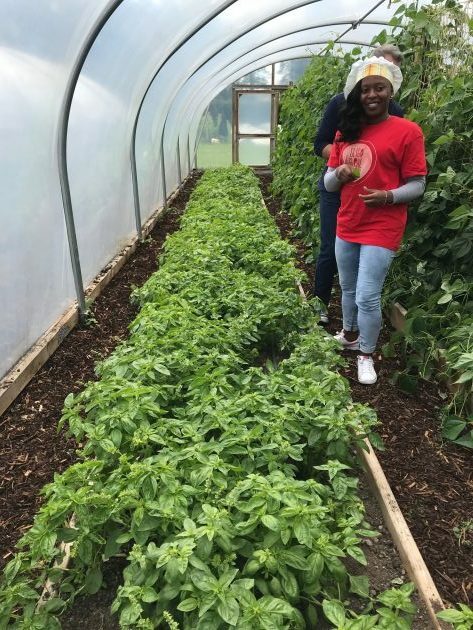 We were delighted to take part in the inaugural Irish Refugee Food Festival which took place across the country throughout June. 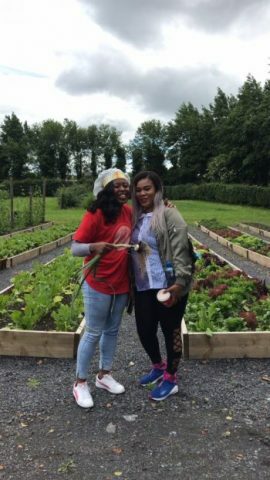 The festival was the brain-child of Mayo woman Lisa Regan and Jess Murphy from Kai in Galway and saw 15 different restaurants in Ireland open their doors to chefs and bakers with refugee status, or refugee applications under consideration, allowing them to showcase their skills and share their culinary heritage. 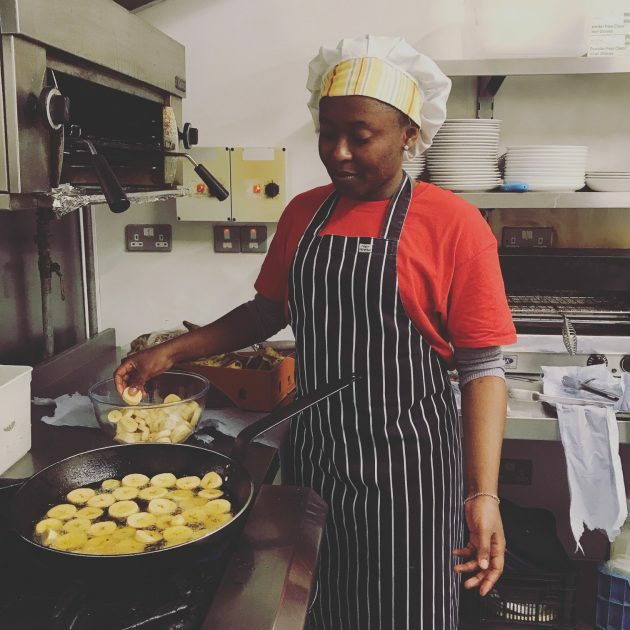 As part of the festival, Mabel joined us for 2 days cooking during the week of the week of June 18th. 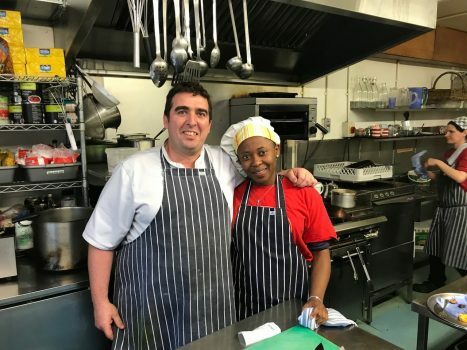 Originally from Cameroon, Mabel fled the West African nation in 2013 and is now based in Sligo. 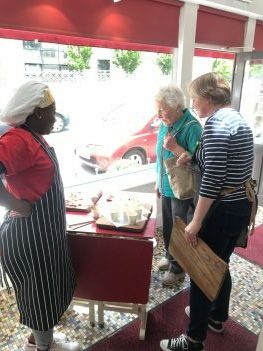 We loved having Mabel share her wonderful recipes with us and we featured some of her wonderful dishes in our cafes and deli over the week. 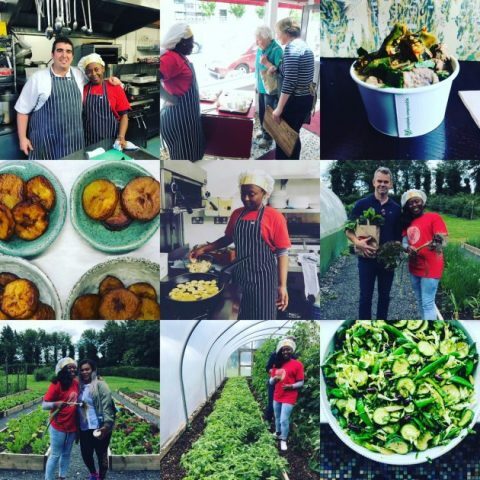 The Beef and Peanut stew went down really well as Wednesday’s hot pot, and those who attended the ‘Slow Food Mayo’ talk that same night loved her canapés including the fried Plantain. 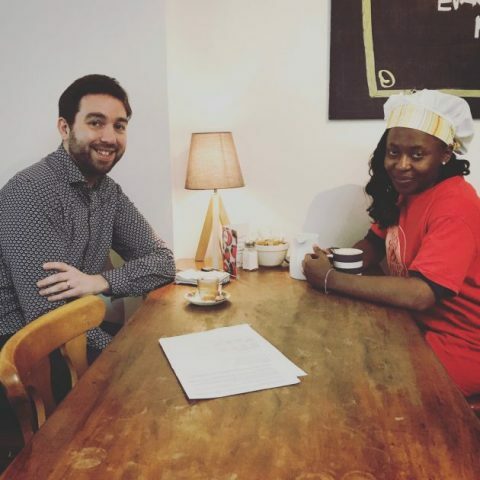 Mabel also worked with Javier in New Antrim street and together, they developed a delicious Cameroon inspired sharing board for our Friday night supper. We also served some delicious Irish Mackerel, marinated in Mabel’s chili marinade that our customers loved. 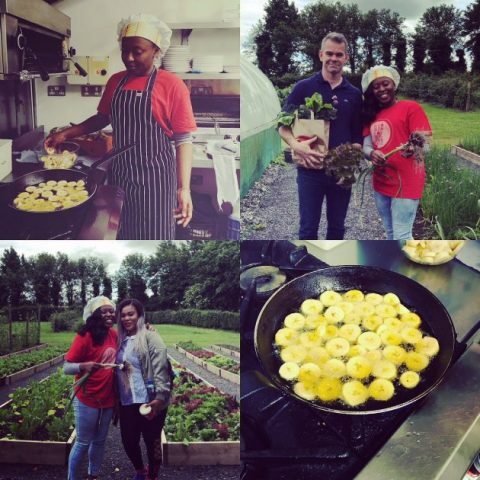 If you’re spending anytime in Sligo this summer, keep an eye out for the ‘Global Kitchen’ project which is run by Mabel, Binta and some other great cooks. 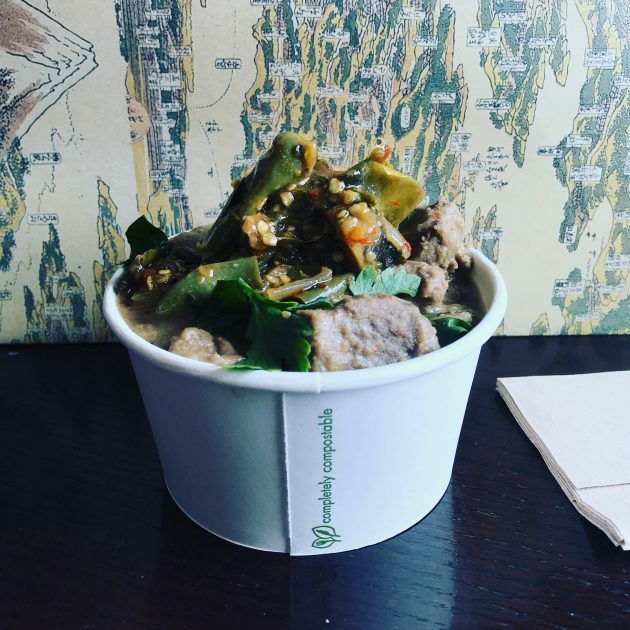 They do pop ups at different venues including the Model Arts Centre, and hope to take the kitchen on the road nationally in 2019. Thanks to Lisa and Jess for including us and the introduction to the lovely Mabel. We’re already looking forward to next year’s festival. Our annual homage to one of our favourite ingredients. 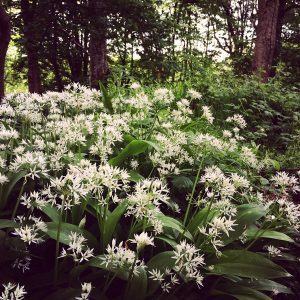 Ramsons, wood garlic, wild garlic; call it what you will, Allium ursinum is a forager’s delight and one of the best natural ingredients around at this time of year. It’s hard to pin down it’s exact season, but the plant is often to be found in abundance around damp woodlands from around mid March until the end of May. Unlike the usual variety of garlic, the wild stuff is prized for it’s leaves rather than it’s bulb. It’s flowers are also edible, but are more often used raw in salads(or delicious if pickled!). It’s distinctive and herbaceous aroma is somewhere between a scallion and normal garlic, and this subtlety makes it incredibly versatile. Be careful when foraging yourself – it looks a bit like the poisonous ‘Lily of the Valley’ plant. For positively identifying wild garlic, a quick grind of the leaves between the fingers should reveal a garlic like smell. We’ll be starting our weekend on the Thursday with a ‘Spring Flavours’ (part 3) cookery demo. We’ll be covering some recipes featuring Wild Garlic , but also celebrating some other great seasonal ingredients such as Sprouting Brocolli, Spring Cabbage, Rhubarb and a shoulder of local lamb. The evening includes all notes, a light supper and a glass of wine and tickets are priced at €35. If you’d like to come, please call our delicatessen on 094 9286072. Our Café menus will be also feature plenty of Garlic with delicious specials at our Friday night supper in New Antrim Street (Book on 094 9023376) as well as dishes like Friendly Farmer Chicken Kievs, Andarl Pork with Wild Garlic stuffing, Fishcakes with poached eggs and wild Garlic hollandaise and our own hot Dog – the ‘Madra Rua’, with local champion sausage maker Sean De Burca’s Wild Garlic bangers! 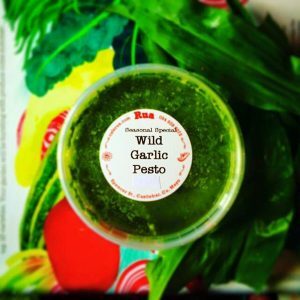 Our shop will also be stocking wild garlic flavoured breads, soups, pestos, tarts and mayo to take home. Sieve all dry ingredients in to bowl. Lightly blitz the wild garlic into the butter milk, and add to the dry ingredients. Use your hand to lightly mix the ingredients until they just come together, and spill out on to floured counter. Shape into one ball or several small ones for savoury scones, and put onto a lightly floured baking sheet. Put into hot 220 degree oven for 10 minutes and then down to 190 for approx. 30 mins. Have a slightly warm slice generously coated with some Cuinneog butter.